Halsey has her own way in celebrating Black Friday. On November 23, the 24-year-old star treated her 10 million followers on Instagram to a racy pic of her that saw her putting out a leggy look. In the photo, the “Bad at Love” singer could be seen sitting in front of a mirror with her long legs wide opened. The New Jersey donned a teal tee that had “GIRLS INVENTED PUNK ROCK NOT ENGLAND” written on it and a pair of black shorts. Completing the look, she slipped into combat boots that further made her style edgier. Considering the pose, the singer flaunted her crotch for everyone to see. However, it seemed like that was not the point of the snap after all. The “Alone” singer held the hem of her shirt with her free hand, making sure that the words were perfectly captured on the camera. Fans also noticed her resemblace to the CoverGirl spokesperson and makeup artist James Charles, now that she rocks her short haircut. “Why did I think this was @jamescharles?” a fan wondered loudly. 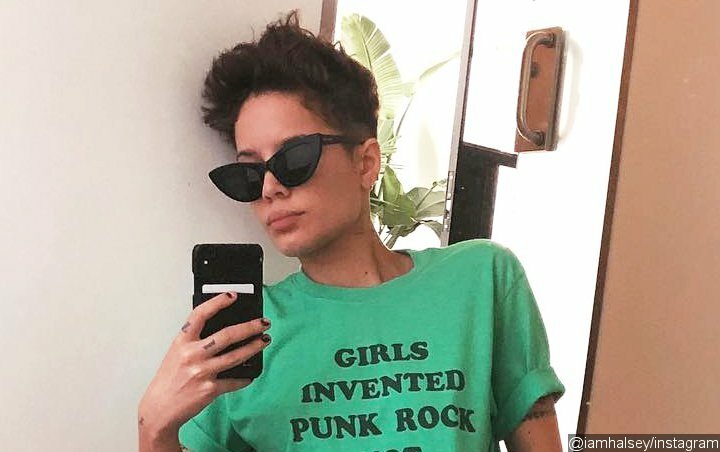 Her incredible figure was not the only things Halsey flaunted on social media. The singer took to Twitter to brag her cooking skills in a video that featured various foods she made for Thanksgiving. “Also. I’m a CHEF chef,” she captioned it. the first part of the HFK tour ended exactly a year ago. I have changed so much since then but all signs point towards me finding my way to the person I’ve always known I was supposed to be. I’m thankful to have wandered back to where I belong. I love you tremendously. Thank you for your kindness and patience and faith. You can always count on me. I’m so excited for what the next few years have to bring and I am so thankful I have millions of you to hold me and help me find my way.